CB Insight published a report introducing new frontiers in retail technologies, which are shaping a future of commerce. This report is presenting also infographic showing more than 130 companies active in developing various technologies applicable in the retail industry. These companies have raised over $3B to help traditional retailers optimize physical stores. Take a look at the infographic which divides companies into groups based on their dedication as augmented virtual reality tools, the point of sale reviews marketing, connected shopping carts, beacon-based analytics and marketing, digital dressing rooms and more. Between in-store bacon-based analytics and marketing group is listed also Sewio. We are glad our company become listed between companies like Unacast and Sensorberg. The location data delivered by Sewio technology is helping store owners to map customer presence, monitor time spent in-store and hot spots in their sales area and this way to evaluate the spatial attractiveness. Sewio RTLS UWB based technology for position tracking is currently widening application in retail mainly due to the provision of more stable and reliable location data. To learn more about how location data works for retail please visit page RTLS in retail. 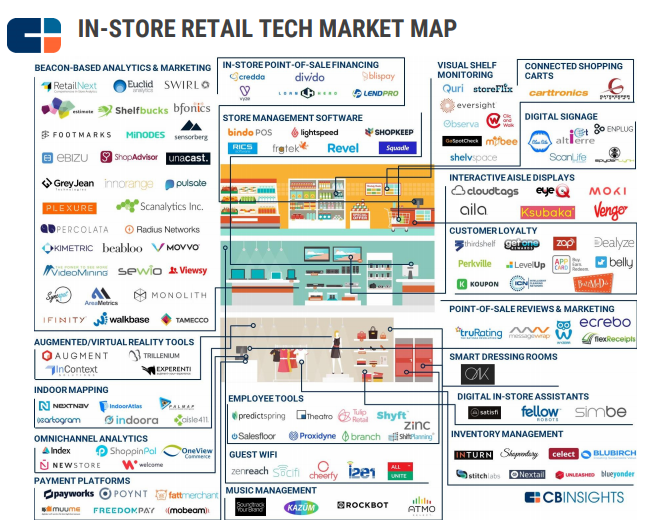 Software data predictive analytics company CB Insights has published an infographic illustrating frontiers in retail technologies. Click here to read the full report Frontiers in retail tech.